2018 was an overwhelming year for the US Healthcare RCM, to say the least. From CMS pressing on mass scale implementation of value-based care to the introduction of new bundled payment method BPCI Advanced, healthcare financial landscape saw the revolutionary transformation, which divided the industry experts into criticizers and appraisers of the same. The revenue cycle processes and its management changes every year with the evolving need of the healthcare system. RCM might seem easy to those for whom all that finances in the healthcare mean the patient is paying the consultancy and medication fees. 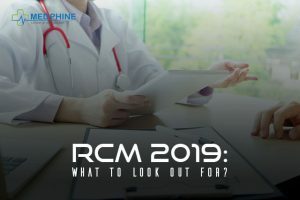 But RCM is much more complicated than it seems, which is why an increasing number of organizations are opting for outsourcing the RCM process to companies like Medphine. And it’s only profitable, think about it, why invest time, money and staff on struggling with the finances when you can have a dedicated team of RCM, billing and coding experts? Healthcare organizations and practices are looking for ways to gain insight into the patient and payer’s data to develop a well-informed strategy and dispense better treatment. Predictive analysis will help in determining when a patient is likely to make the payment. It can also assist in predicting how the next month’s reimbursement is going to follow, knowing which you can develop a strategy beforehand. Being able to keep a tab on the patient’s behavior and payers trend can help practice finance run smoothly and become more efficient. With the denial management finally seeming to be streamlined, the introduction and implementation of technology might be more prevalent in the healthcare practices in an effort to reduce claims denial and keep the revenant cycle management as smooth as possible, for the provider and payer, both. CMS ended 2018 with rather shocking news for the healthcare providers when it asked them to make their prescriptions and procedures cost visible on online platforms for enhancing transparency. As patients are becoming more aware and keen of being informed as to what they are paying for, CMS urge to reveal the cost will also enhance the quality treatment in the long run. Although this procedure is still a discussion of debate, price and quality transparency are crucial to enrich the patient experience, streamline practices operation and keep the practice financially healthy. With the healthcare system becoming intricate year by year, practices and physicians instead of analyzing and resolving the financial issues themselves would prefer outsourcing the entire RCM along with medical billing and coding solution. We at Medphine proffer comprehensive solution for your healthcare practice finance system, right from claim denial management to specialty-specific billing to RCM. You can trust our services in ensuring maximum revenue generation with minimum overload. Our team of certified billers and coders implement HIPAA compliant strategies to ensure your healthcare finances are streamlined and there is visible growth of collections, reduction in claim denials and clearing up of clogged and aging account receivables. Try our risk-free 30 days no long term contract service and watch your practice’s RCM transform!